Whether you are looking for a new or a certified pre-owned machine, we take great care in matching the best product and value for your specific needs. We have been in business for more than a decade so you can trust our knowledge of product and our commitment to servicing you today as well as tomorrow and years from now. Strategy Machinery Inc. strives to provide the highest quality woodworking machinery to our customers. We are very strategic in selecting the new and pre-owned products we offer. All pre-owned equipment is refurbished, tested and certified in our own manufacturing facility. SawStop's 10" cabinet saw was developed from the ground up with a particular focus on safety and quality. It features a revolutionary safety system that stops and retracts the blade (within 5 milliseconds) upon accidental contact, drastically reducing the severity of user injury. 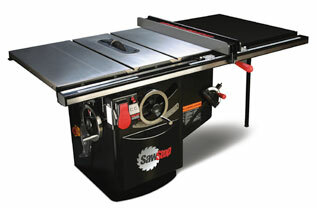 SawStop Now has Industrial Cabinet Saws, Professional Cabinet Saws and Contractor Saws!